Have you been collecting yet? Some notes on basketry fiber harvesting, by Kay Harradine, for the personal use of basket students and friends. Copyright July 2002. Do not reproduce and/or sell without written permission from author. Remember to follow the principles of the Gatherer's Creed: Always ask permission of the land-owner or agency. Get a permit where required (State and Federal forestlands and beach gathering). Always leave more than you take. Spread your harvesting activity over the resource (take a few leaves from each plant, not all the leaves from one plant). Leave no trace of your passing (pack out your litter, fill in holes, leave no scars on plants, etc.) Use what you take (do not waste the resource) and/or share your harvest with others. And don't forget to have a ceremony before you harvest - offer something in return, to the Land, to Mother Nature, to the Great Spirit, to Gaia, to the plant itself, or to whomever you believe in, asking permission and giving thanks for the gift you are taking. Tobacco, grain, strands of your hair, are traditional - anything of symbolic value to you will work. This will remind you of your responsibility to the land, and of the value of the resource. With regard to removing plant products from the National forests and parks, State lands and other civic jurisdictions, there is a permit process which does have merit, I believe. Here is some anecdotal information from my experience. I don't believe, even with a permit, you are allowed to take from National Park lands. The purpose of those lands is not multi-use, nor to make physical resources available to the public for private use. However, the goals for management of other public lands, such as US Forest Service, Department of Natural Resources, etc., do include some reasonable harvesting of plants, including trees for pulp and timber. My experience with gathering on state lands has been positive. Upon requesting a special use permit to dig cedar roots, or to gather cedar bark, or to harvest bear grass, I have to fill out a short form and answer a few questions. The ranger usually wants to know how much I am gathering - if it is for my own personal use, there is usually a small fee. If it is for commercial use or resale, then there is a more substantial charge. In either case, I am guided to an area where it has been determined by resource experts that my gathering will not harm the local environment, or where the trees are scheduled to be cleared or thinned. While it may seem like American forests stretch on forever and are non-exhaustible, I am horrified every year by the stories of poachers - people who strip resources from public lands for their own personal gain. What is most distressing is the way they have no regard for the plant or the environment - they tear up blueberry bushes by the roots. They chop every blade of grass on every plant, they do not follow the gatherer's creed: Leave more than you take, share what you have, do not waste what you take, leave no trace of your passing (pick a few leaves here or there, fill in the holes you dig, etc.) In the case of mushroom gatherers, they sometimes protect "their" patches with guns. The vines and barks and grasses and roots that basektmakers want are sustainable resources if they are wisely and minimally taken. The bear grass leaves I use in my baskets are also taken in great quantity by people for the florist industry and often shipped to Asia. Even they should be able to see that this product will not be there for their income next year if they overharvest this year, but greed is shortsighted. 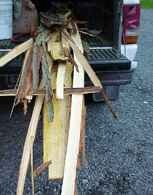 Confiscated beargrass which has been poached has been given to the Oregon guild for disbursement to basketmakers, so that it is not wasted once it has been ripped indiscriminately from the ground. Small consolation. Below is a list of plants you might consider, available in many gardens, or wild in the Pacific Northwest. Always keep in mind the "long, strong, thin and flexible" motto of basket fiber gatherers. Leaves: any of the flat sword shaped leaves from iris, daffodil, day lily, crocosmia, etc. Dry well and mellow before using. Vines: wisteria, grapevine, Indian Currant, honeysuckle, kiwi, akebia, clematis, ivy, etc. Strip off the leaves and coil to dry. Roots: when weeding, collect and coil up any flexible roots you come across, roots from cedar and spruce trees are excellent, can be used whole with bark on, or peeled and split. If you have in your yard, try Jack Pine, Tamarack, Paper Mulberry roots too. Bark: Try peeling bark off branches and trunks of anything you might be pruning (trees or shrubs) such as poplar, hickory, basswood, redbud, lilac or birch. If it comes off in strips and its flexible, its probably weavable, coil it up to dry. Branches: the fine twigs of birch trees are great texture in baskets when fresh. Fresh weeping willow strands can also be used. Fruit tree water shoots (apple, plum, cherry, pear etc.) or nut tree branches (hazel, walnut, etc.) are flexible and can be made into hoops for rib basket frames. Look for dandelions that are really tall after the flower has gone to seed - cut and save the flower stems - they are satiny and very pretty (hang by the flower head but blow off the seeds first). Bindweed (white morning glory) has great fine vines for twining, strip the leaves and coil up. Cattail, Bulrush, Coastal Sweet Grass, Needle Rush, Slough Sedge (Carex obnupta) are all good, pick in the early fall. Make sure you rinse off the salt and mud and thoroughly dry over several days to a week, with lots of air circulation. Collect the red colored runners of the sand strawberry, one of my favorites. Or gather seaweed - the big bull kelp whips or fine wiggly seaweed - but get a permit, its required. Also its easier and less smelly to bring home the already-dry stuff off the beach. Its late for cedar bark harvest - too sappy in the summer, but will be better again in the fall or next Spring. But try other barks, like big leaf maple, or wild cherry bark. All these are harvested by cutting right to the wood with a sharp utility knife, in parallel cuts, and peeling off the layers of bark (kills the limb or the plant.) Branches, either whole, or split into splints, of several plants (cedar, vine maple, etc.) can be used, but these must be used fresh. Roots of many plants are great, used whole or peeled and split, and can be taken all year long. Gather long dropped pine needles in dry areas for coiling. (side of the road, clear-cuts, etc.) Lots of good stuff to weave with here. Cut the stems of fireweed or tall stinging nettle (gloves required!) for fine fiber cordage making later - dry the stems. IN Eastern Washington, milkweed and dogbane (Indian hemp) are harvested for the same purpose. Several species of native scrub willow can yield thin shoots for weaving, or bark from bigger limbs. Red Osier grows wild along road ditches. The more you clip it, the better the shoots will be next year! Tall horsetail, the kind without side whorls, is a strange and wonderful addition to baskets (fresh). Runners of the low ground native blackberry can be pulled through leather gloves and coiled for later use or woven fresh. save your corn shucks from corn-on-the-cob - spread out to dry. Try houseplant prunings - vines or dying leaves, or air roots or stems. Initial prep and storage depends on the material, but in general soft leafy things need to be dried with plenty of air circulation right away - hang in loose bundles or lay out in thin layer and turn over twice a day. 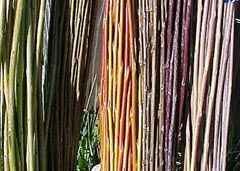 For woody things like vines and bark, that will soak again, it is good idea to make into "bucket" sized bundles/rolls, except long willow or osier shoots, just bundle together. Always store in a dry place, (but not near wood heat ideally.) If you dry things adequately, there should be no fungus problem, unless you then put it in a damp place for storage. Hang materials from rafters, store in boxes, or wrap in paper or cloth to keep dust off and bits from shedding. Rarely is it a good idea to store natural fibers in plastic, especially in high humidity. There are no strict rules - so go out and experiment. We have very few poisonous plants around here in the Pacific NW, the one possibly attractive exception is DEADLY NIGHTSHADE, which is an introduced vine (therefore long and weavable, but all parts are poisonous if ingested, so leave it alone). It has small dark purple flowers with yellow centers which look just like the flowers on a tomato plant, but purple. Later it gets small bunches of pea sized fruit, shiny and smooth, that are green at first, then turn bright red. Avoid this and you should be okay. If harvesting elsewhere, avoid poison oak and poison ivy by following the rule, Leaves of Three, Let it Be. When in doubt, always err on the side of caution. A gathering journal is a very good idea. Include notes on where you found the materials, map to locate & driving directions, what time of year you gathered, how tall/big/prolific, how you stored and prepared, Name of person who gave you permission to gather there, etc. It can be a very useful resource both for yourself, and for your group, if you choose to share all your hard-won lessons. You will be able to evaluate the various sites from year to year, and if ever necessary, you can use the data to lobby authorities for continued access, or to cease polluting, etc. Now go out there and gather some weaving fibers. You will feel rich and have fun.